September 10, 2017 - Pairing popular chefs with our local food producers brings a day of fun for the entire family; the Municipality of Tweed and Foodland Ontario presents Our Backyard Feast From Farm. Enjoy a day of great food, shop at our farmers market, taste great craft beers, and sample local wine. 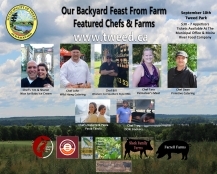 Tickets may be purchased at the Municipality of Tweed office, Moira River Food Company, and online by visiting https://www.eventbrite.ca/e/our-backyard-feast-from-farm-tickets-36521515837.